Works of Odon, Bernadette Chéné, and Maria Theresa Herbin. 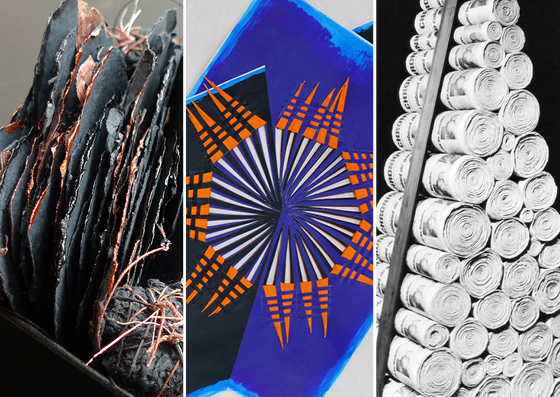 These artists come from a family bound by the same need to create with simple materials from everyday life: newsprint, kraft paper … so they cut, folded, woven, wrinkled, braided, carved, transforming paper into a work of contemporary art. In reference to our 2004 exhibition, “From fiber and yarn,” we take our research and discovery of talented artists and recognized by their innovative and amazing works in their design. (Professional binding machine installed in Sens). You will learn to create unique books from decorated papers and folded papers. The decorated cover is made from cut or torn magazine paper, glued, sanded and stained and waxed. The inner leaves of different colors and creating a colorful gaggle are folded into origami. The folded kraft paper cover is decorated using the technique of paper dominoté using tampons carved a potato. Inside, the leaves are sewn to the cover. The various techniques learned to make these books and require inexpensive equipment can be taken at home and declined to infinity to ever more inventive creations. This workshop is open to children from 7 years and adults. Do not forget to book in advance as places are limited (12 places)! Snack break the museum. – Visites individuelles sur rendez-vous. à 1h30 de Paris, par l'autouroute A6 ou par le train à la gare de Paris-Bercy, arrêt à la gare de Joigny ou d'Auxerre.